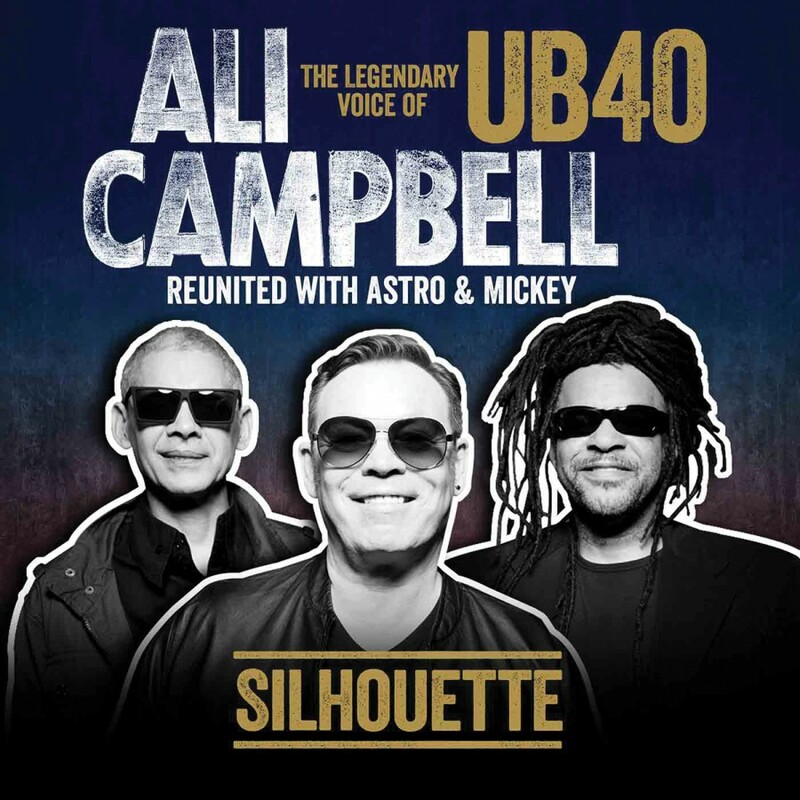 When vocalist Astro and keyboard player Mickey Virtue rejoined forces with Ali Campbell, the spirit of their old band UB40 was never going to be far from the surface. All three were founding members of the iconic Birmingham reggae troupe who topped the UK singles chart on three occasions and sold 70 million records as they took their smooth yet rootsy musical blend to all corners of the globe. Having reiterated their credentials as consummate live performers with triumphant gigs this year in places as far flung as Nigeria, South Africa and Papua New Guinea, Ali, Mickey and Astro are now turning their attention to the studio and a new album, Silhouette, that is an inspired mix of freshly-minted new songs and sparkling, reggaefied cover versions of classics by The Beatles, Bob Dylan, The Chi-Lites and others. Silhouette, recorded in London's legendary RAK Studios, plays unashamedly to the trio's strengths. Ali's voice, described by Astro as being 'like a fine wine' (red, presumably), remains as strong as ever - rich, melodic and instantly recognisable. With the redoubtable Astro lending strong vocal support and Mickey's keyboards to the fore in a new band that includes a three-piece horn section, their lithe but potent sound should delight fans old and new. As original members of UB40, Ali, Mickey and Astro helped to define reggae music for a generation. The multi-racial band, formed in 1979 in the Birmingham suburb of Moseley, pooled a diverse set of influences to put a fresh, indigenous slant on Jamaican reggae. After encouragement from Chrissie Hynde, who offered them support slots with her chart-topping band The Pretenders, they recorded their independently released debut album, Signing Off, on an eight-track tape machine in the home of producer Bob Lamb. An unexpected number two album, it gave them the conviction to chart their own course. UB40 went on to dominate charts around the world, not least with the hugely successful Labour Of Love series. The first Labour Of Love album, in 1983, yielded a cover of Neil Diamond's Red Red Wine that topped the charts on both sides of the Atlantic. The band secured two further chart-topping singles at home in (I Can't Help) Falling In Love With You (also another US number one) and I Got You Babe, a duet between Ali and the band's old friend Chrissie Hynde, and Ali and Robin Campbell also scored a No.1 with Baby Come Back. When Ali Campbell departed in 2008 after 29 years and a dozen major world tours with the band, he was followed out of UB40 by Mickey Virtue. Campbell, with Mickey lending a helping hand, has since released four reggae-themed solo collections. Astro remained with the band until November 2013, when he left to team up again with Ali and Mickey. Now, following some spectacular gigs at home and abroad, the trio are facing the future with renewed confidence and vigour.